Diondra and Shane Colquhoun dreamed of opening a wine bar for a few years, but when the opportunity to purchase a one-of-a-kind 1953 Chris Craft Venetian Water Taxi — Golden Rose — presented itself, their vision changed. 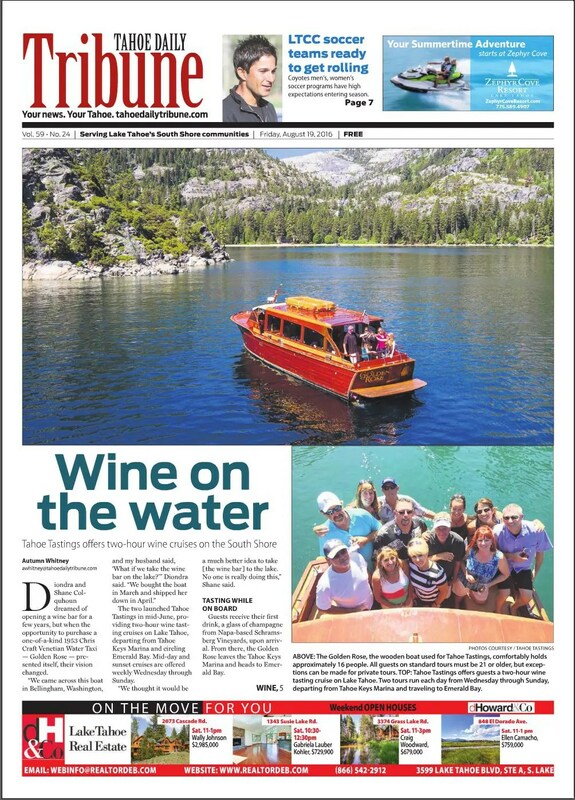 The two launched Tahoe Tastings in mid-June, providing two-hour wine tasting cruises on Lake Tahoe, departing from Tahoe Keys Marina and circling Emerald Bay. Mid-day and sunset cruises are offered weekly Wednesday through Sunday. “We thought it would be a much better idea to take [the wine bar] to the lake. No one is really doing this,” Shane said. Guests receive their first drink, a glass of champagne from Napa-based Schramsberg Vineyards, upon arrival. From there, the Golden Rose leaves the Tahoe Keys Marina and heads to Emerald Bay. Along the journey, attendees have the opportunity to sample eight wines — both red and white — from different wineries in Northern California. “Everyone everywhere knows Napa and Sonoma. We wanted to showcase some of the other wineries. We picked some of our favorites,” Diondra said. Featured wines come from Amador, Monterey, Yolo, Nevada and El Dorado counties, along with the Sierra Foothills and, of course, Napa Valley. The Colquhouns hand-selected each wine, which are all exclusive to the Golden Rose and their respective winery tasting rooms. When the Golden Rose reaches Emerald Bay and the tasting portion is finished, guests select a glass of their choosing to enjoy on the trip back to Tahoe Keys Marina. Built in 1953 as a Chris Craft Double Cabin Fly Bridge Cruiser and originally named In the Mood, Golden Rose — before she was given her new name — was destroyed in a blizzard in December 1996. Partially sunk and heavily damaged, In the Mood was destined to be scrapped when Terry Buzzard of Island Mariner Cruises, the first whale watching tour in Bellingham, decided to recreate her as a Venetian Water Taxi. Found in various areas throughout the boat’s design, 24-karat gold gives the vessel her new name, Golden Rose. To learn more about Golden Rose, visit Tahoe Tastings’ website. Daily standard tours have an age requirement of 21, however exceptions can be made for private tours. Recommended attire includes flat shoes and clothing acceptable for all climates, as weather in Tahoe can change quickly. Bathing suits are not allowed. Tickets are $90, but discounted tickets for designated drivers or those who don’t wish to drink wine are offered for $60. Local-only specials will be offered after Labor Day, according to Diondra. “We’re really adamant about trying to get locals on the boat. The best way to get word out is through word of mouth,” Shane added. Golden Rose, 40 feet long by 12 feet wide, is licensed for 28 passengers, but the Colquhouns try to keep capacity to approximately 16 people so it doesn’t feel too crowded. Exceptions can be made for private tours. “We’ve done 20 people on the boat. If everybody knows each other then it’s not a big deal. If it’s a bunch of strangers, you don’t want to be sitting on each other’s laps,” Diondra added. Reservations can be made online at Tahoe Tastings’ website, or by calling 530-494-9222. Same-day reservations are allowed, but a phone call is required prior to arriving at the marina. Tahoe Keys Marina is located at 2435 Venice Drive. For more information, visit http://www.tahoetastings.com or call 530-494-9222.